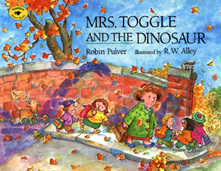 Mrs. Toggle is in a tizzy. The principal has told her to get ready for a new student. But this is no ordinary student. It's a dinosaur! Mrs. Toggle has never taught a dinosaur before. There's so much to do to make it feel welcome. Mr. Abel, the custodian, must make a desk big enough for it and Mrs. Burns, the cook, needs to know if it's a vegetarian or a meat-eater. How will Mrs. Toggle ever get ready in time? When the new student finally arrives, Mrs. Toggle is in for a big surprise. And she learns to take her own good advice: if you don't understand something the first time you hear it, ask questions. Children are often accused of not listening or paying attention But adults--even teachers--can get things wrong, too!